This week I interviewed Tracy Bass from Buddy Notes.com. Tracy is new to blogging but hopes she will be able to connect with like minded parents through her website. Scroll down for my exclusive interview with Tracy. HM: Where are you from? HM: When did you start blogging? Tracy: I have been blogging for a little over three months now. So I am still pretty new. I started out with my website www.buddy-notes.com and adding the blog just seemed like a natural fit. HM: Why do you blog? Tracy: I blog to try to connect other parents and to share recipes that families can use. I also blog to share the importance of writing for kids and to encourage creativity. HM: What is your blog about? Tracy: I am a parent. My blog is about real life things that parents can use and do with their children. We all know what the “experts” say but it’s nice to have a place to talk with other parents. One of the big challenges for parents is the family meal. Each week I include a family friendly recipe and I will even feature recipes from readers. HM: What do you want your readers to get out of your blog? Tracy: I hope that all of my readers would get something useful to them out of my blog. Not all of us are looking for the same things, but I hope that I have enough variety so that everyone can find something useful. HM: What do you do to get your readers to keep coming back? Tracy: As I mentioned before, my blog is tied into my website, www.buddy-notes.com. The website has pen pals for kids and other fun, creavtive mail packets for kids. We have monthly specials, giveaways and contests. The blog also features a game that I have found many people really enjoy. HM: Do you have any favorite blogs or any blogs that you read regularly? Tracy: I do have a few favorites that I enjoy reading. I really like The Busy Pepper Mill, Hoosier Homemade and Singlemommyhood. I have several I read but these three probably top the list. HM: Do you have any advice for other bloggers? Tracy: The only advice I would offer to other bloggers is to blog about what you are passionate about. Don’t try to fit into some kind of mold. Be yourself and it will shine through in your blog. 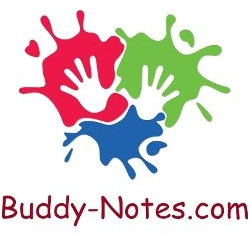 You can visit Tracy at Buddy Notes.com and the new Buddy Notes Blog. I invite all Mommy and Health bloggers to be in the spotlight. Click here for more information on how your blog can be in the spotlight on Healthy Moms. Sounds like she has neat things for parents and kids!